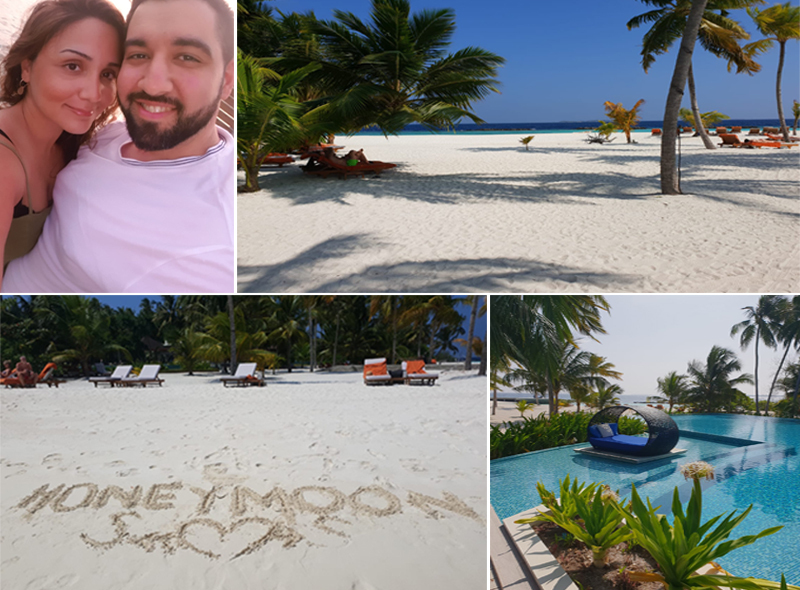 Our lovely clients, Suavi and Suzan spent almost two weeks in South Africa and Maldives for a once-in-a-lifetime honeymoon. 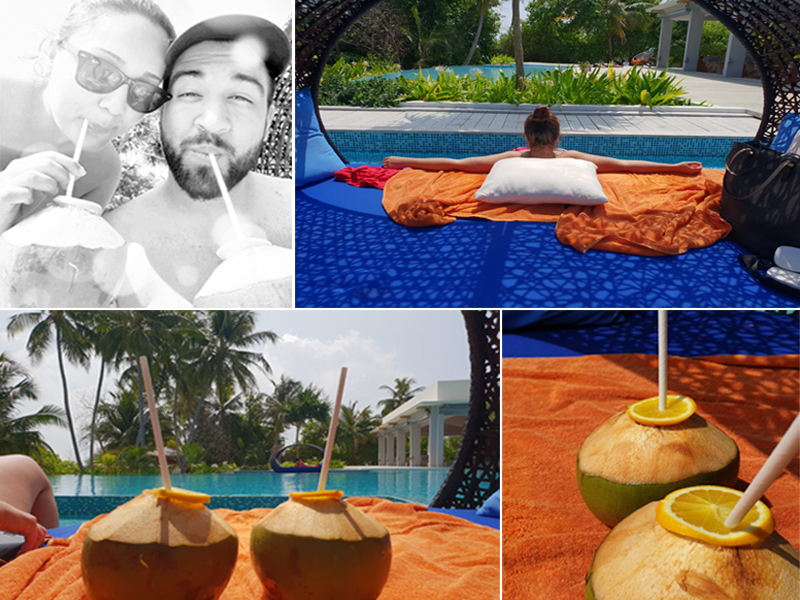 We caught up with them to see what they got up to on their amazing honeymoon trip of a lifetime booked by our honeymoon specialist, Leigh…. 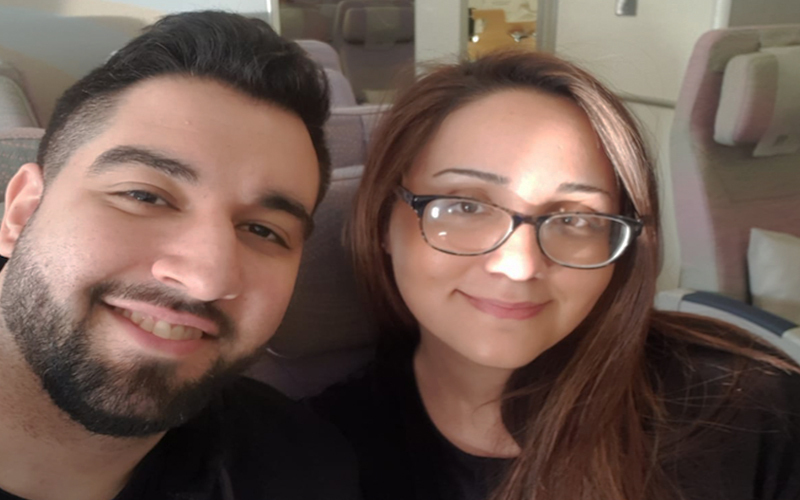 How was your flight to South Africa and Maldives ? The majority of our flights were with Emirates. As expected, the flights were smooth and comfortable. We also had ‘domestic’ flights including Johannesberg to Skakuza in South Africa and Male to Dhigali Maldives. The flights in themselves were experiences. We flew in the smallest plane to Skakuza, which overlooked a national park and the scenery was stunning. However, in Maldives we flew in a sea plane to Dhigali. At first it was daunting, but it was one of the smoothest flights we’ve ever had. It was also a great way to see some of the other islands. Once we arrived in Lion Sands Game Reserve, we were quite simply in awe. From the moment we approached the entrance to the lodge, we knew that we were somewhere special. 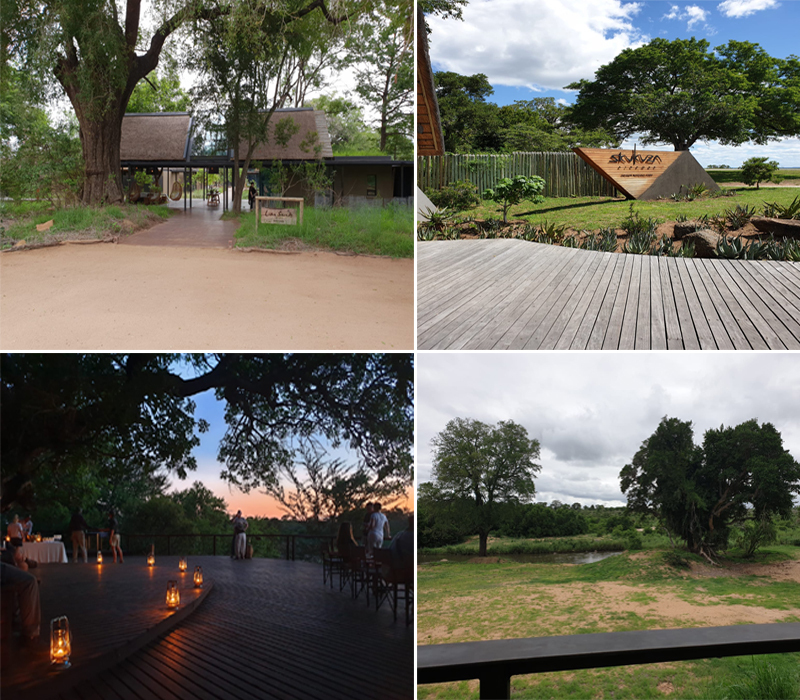 The incredible lodge overlooks the Sabi Sands river and has a large diversity of wildlife species including the big 5 as well as many other African species such as zebra, giraffe, hippos and crocodiles. The staff, grounds and the appearance of the lodge were nothing short of perfection. We were absolutely amazed by this stunning boutique lodge over our 3 nights stay. 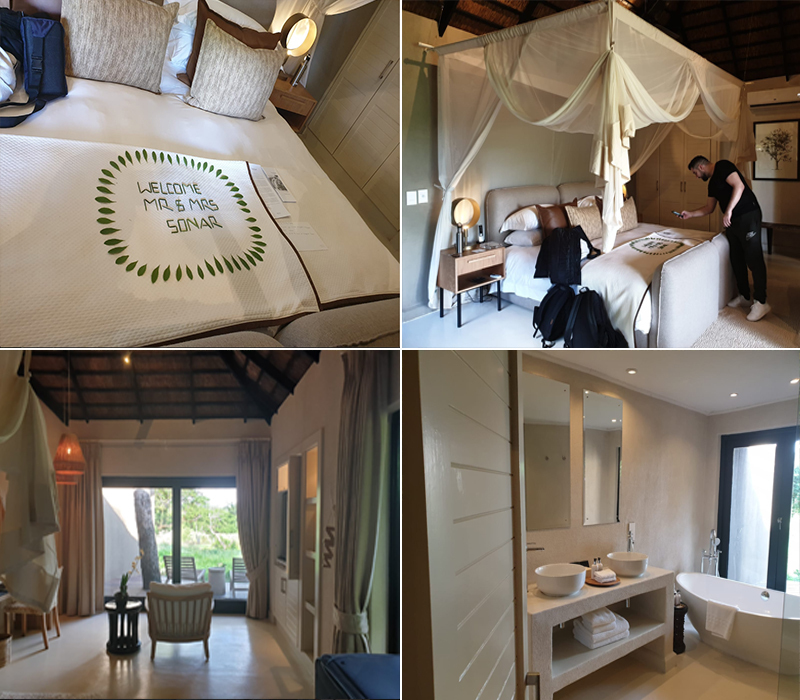 Our luxury room in the River lodge was beyond expectations at Lion Sands it had a spectacular view of the Sabi Sands river and a romantic four-poster bed and bath tub with doors opening out onto the grass by the river. As a lovely welcome message, our names were also spelled out in flowers on our bed, it could not have been more perfect. 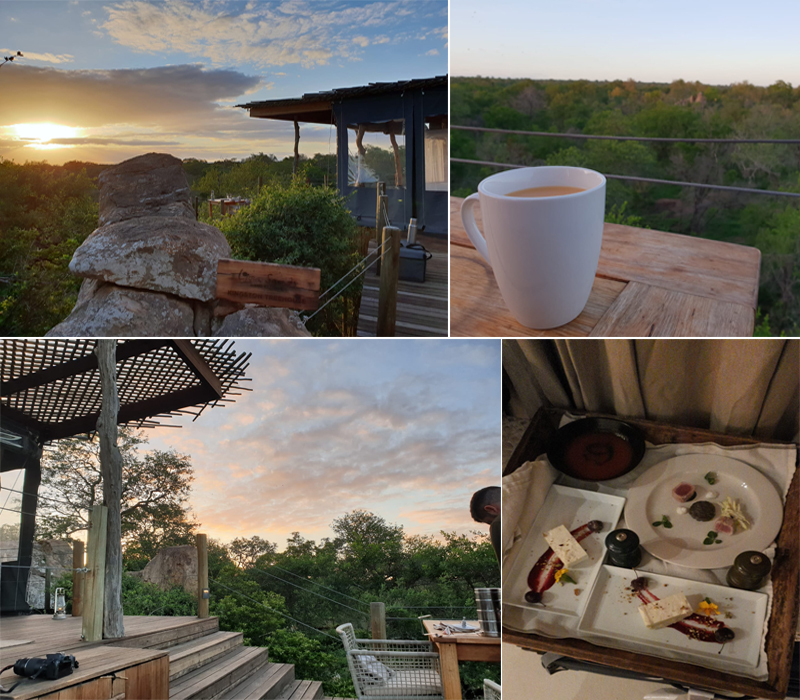 A typical day at Lion Sands started off with a 5am wake up call with light breakfast and freshly made tea/coffee refreshments. It was pretty early but it was the best time to head out for an early morning 3 hour game drive to ensure that you get to see the entire bush wake up. 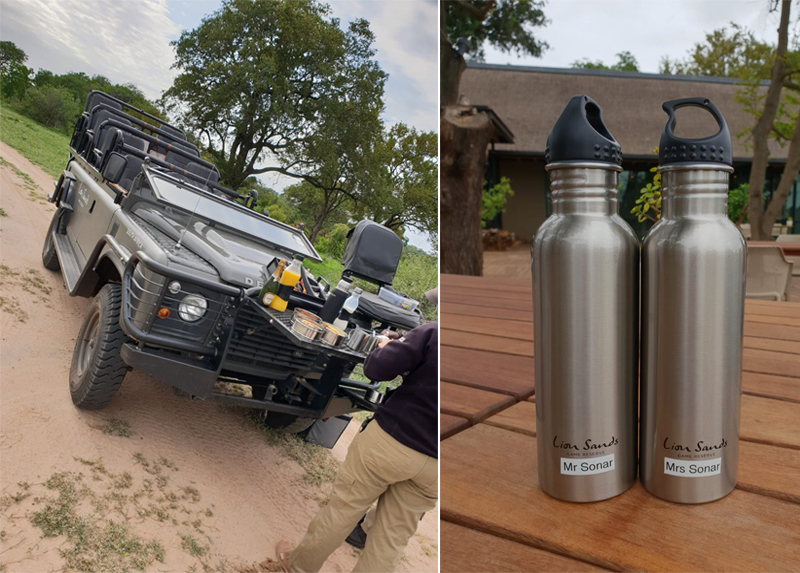 We were also given personalised water bottles to take on our game drives, which we thought was a lovely gesture. The game drive sure was an experience to witness the wildlife early in the morning and certainly a great start to the day. During our game drive we had a pitstop for refreshments and a great conversation about South Africa and its wildlife with our tracker guide and driver before we drove back to the lodge. Once we arrived back at the lodge we were served lovely lunch by our very own personal butler. 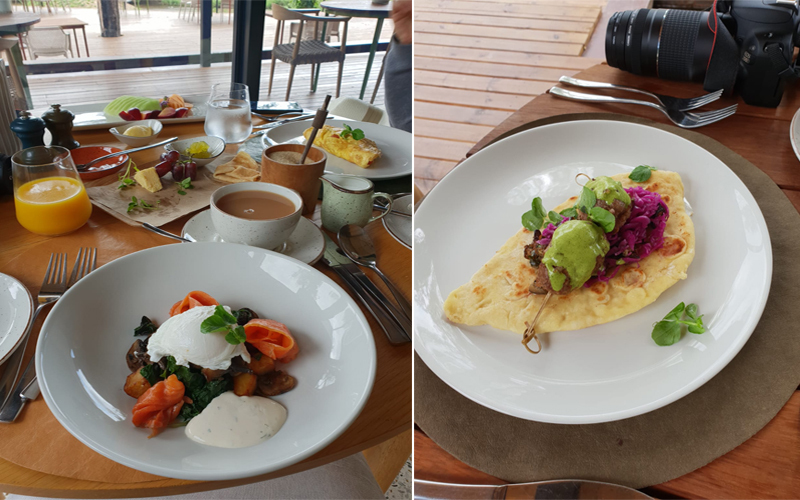 Breakfast, lunch and dinner was served in one place which was at the River lodge restaurant at Lion sands. However, our menus were personalised too which included our names on them. 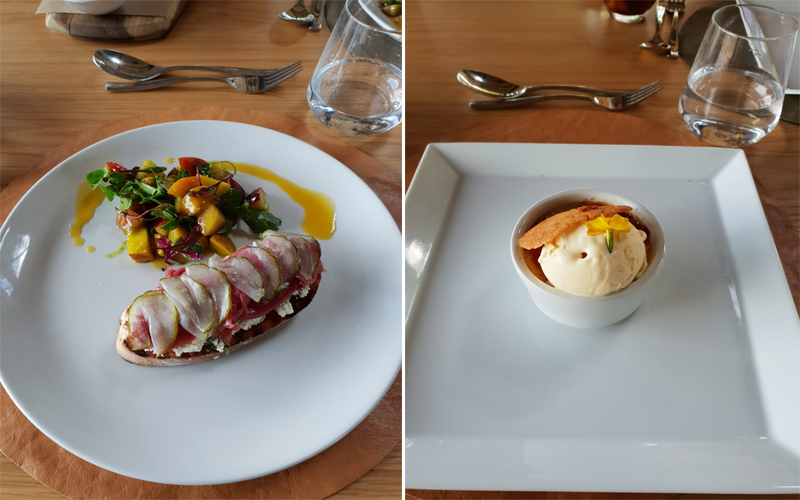 We were able to select a breakfast option and a three course lunch and dinner options too. 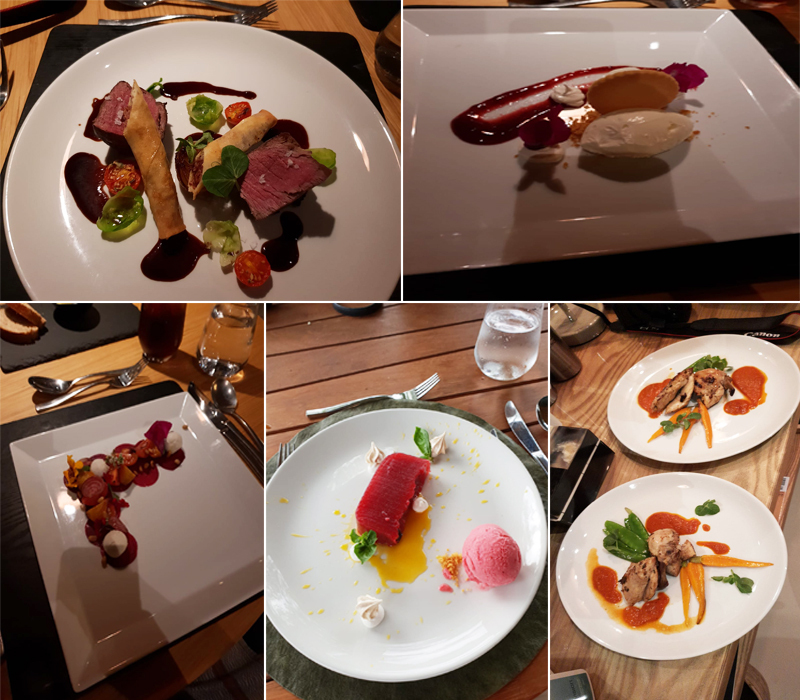 The food was nothing short of high quality restaurant standard, meals were excellently prepared and delicious. We would certainly give the restaurant and food, a five star rating. We also had our own butler that served us at every meal. After lunch we had the chance to relax and enjoy some leisure time before our next game drive. 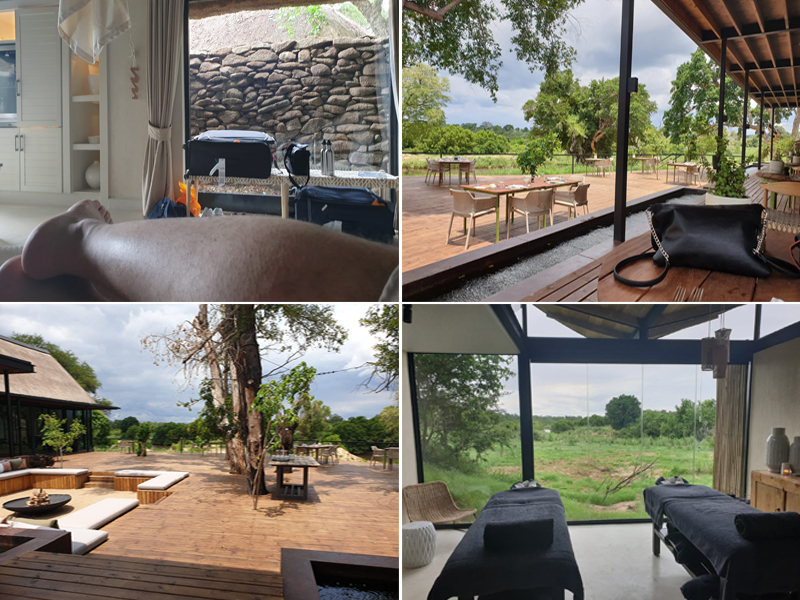 From having a quick much-needed nap in our room, chilling out by the pool, sipping cocktails in the bar or fire pit lounge to enjoying a couples massage at the spa, it was certainly needed after a early long game drive. While we were there we used the spa facilities, we were lucky to receive some free spa products at Lion Sands. Also, we purchased a few souvenirs from the shop. They had a photography lab to edit pictures of wildlife but we didn’t get a chance to use this but we highly recommend it. We had lunch at 1pm and then afternoon tea was served at 4pm before our second game drive of the day. The tea consisted of light snack bites, sandwiches as well as teas, coffees and juices. After we met our expert guide and driver at half 4 for our evening game drive which lasted 3 hours tracking animals and birds in the private game reserve. 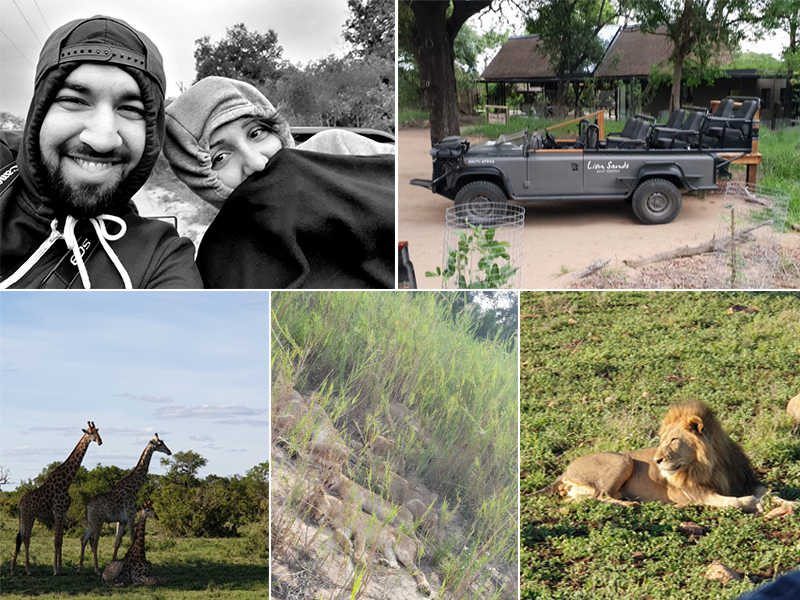 Again, we took a halfway pitstop in a scenic spot during our game drive for light snacks and a sundowner drink to appreciate being in the bush and experience the magical moment during the night. After we arrived back at the lodge, we had a quick change and had dinner which was served by our butler. Once dinner ended it was back to our rooms to unwind and rest up and to repeat it all over again the next day. The staff were lovely as they decorated our bedroom each night with champagne and candles. They also gave us some bath salts and handmade soap. Before we went to sleep, we went through all the pictures taken on our camera. We were amazed how much we did and saw within one day. Last of all, as part of our experience at Lion Sands we had the chance to stay one night in an open treehouse in the middle of the bush. We got to spend the night under the stars in the Kingston Treehouse. These are only available to guests who stay in the River lodge or Ivory lodge. 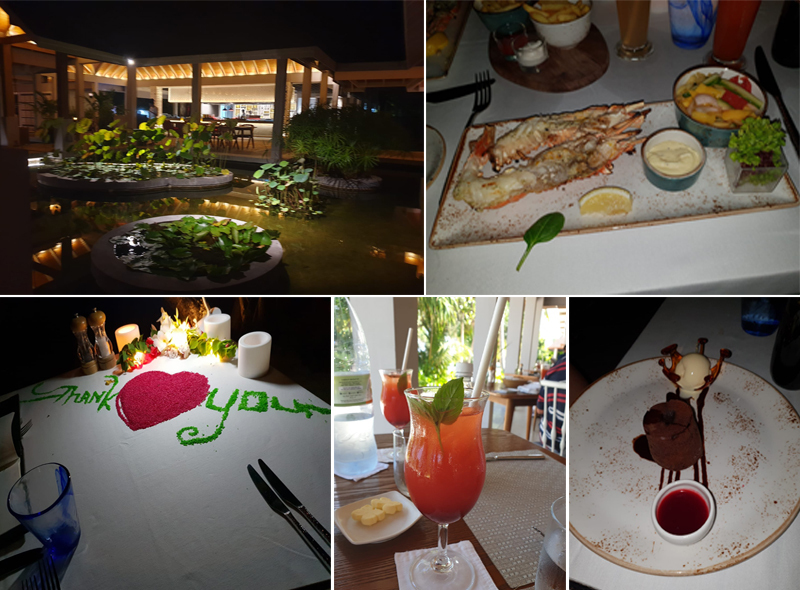 It was truly magical and romantic as we gazed at the stars, heard local wildlife make noises and enjoyed a picnic sunset dinner and Champagne breakfast. It is a once-in-a-lifetime experience, so we definitely recommend it. Our next destination was Dhigali in Maldives, we thought that the island was stunning and there was an abundance of marine life. The moment we arrived in a seaplane it was absolute paradise and the weather was great too. Our room at Dhigali was very spacious and looked stunning, we stayed in a water villa which overlooked the ocean. On arrival, it had been beautifully decorated for us with fresh flowers and a welcome message laid out. The room featured a king size bed, two sun beds on our private deck with stairs leading down to the sea and an appointed bathroom with rainfall shower and beautiful ocean views. There were a number of restaurant options at Dhigali, our favourite was Faru. It had a menu of grilled options, selection of drinks and the service at Faru was very good. 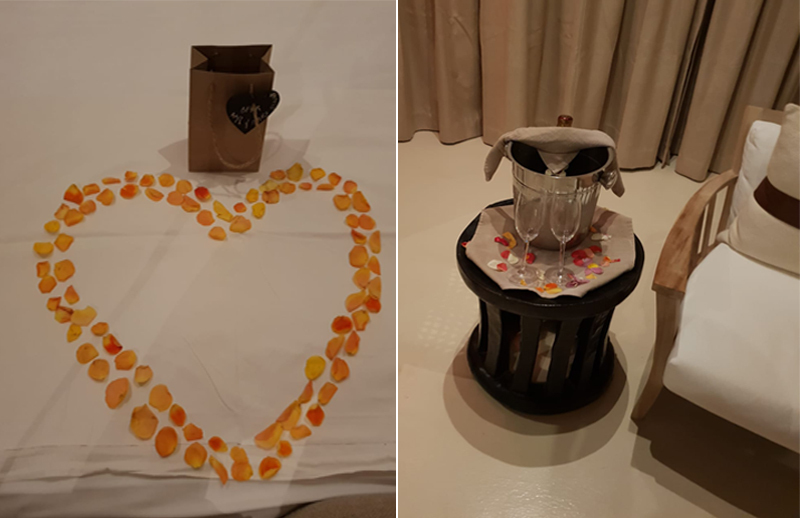 The staff did everything they could in this restaurant to make our honeymoon feel special including decorating our table. In addition, during our 7 night stay we made full use of the array of facilities available including the pool, the spa and the outdoor cinema experience under the stars, which was very romantic. Not only that one of the days we went on a dolphin cruise excursion and saw a pod of dolphins, which we thought was amazing. We also went on a glass bottom boat, where we saw a variety of fish and even spotted a turtle. We tried to make the most of our stay in Dhigali. A typical day started off with waking up whenever we desired then go down to Jade restaurant for a buffet breakfast. After breakfast, we would head to the beach to relax and enjoy the sun rays or take a refreshing dip in the pool. Nothing more wonderful than soaking in some rays and getting a tan in the Maldives. We recommend bringing lots and lots of sun block too. Then after some leisure time, we would have lunch at one of the restaurants, then enjoy more time at the beach and pool. In the evening, we would head back to our room and get ready for dinner. Delicious food, great entertainment and watching the stars sure was the perfect end to our day. 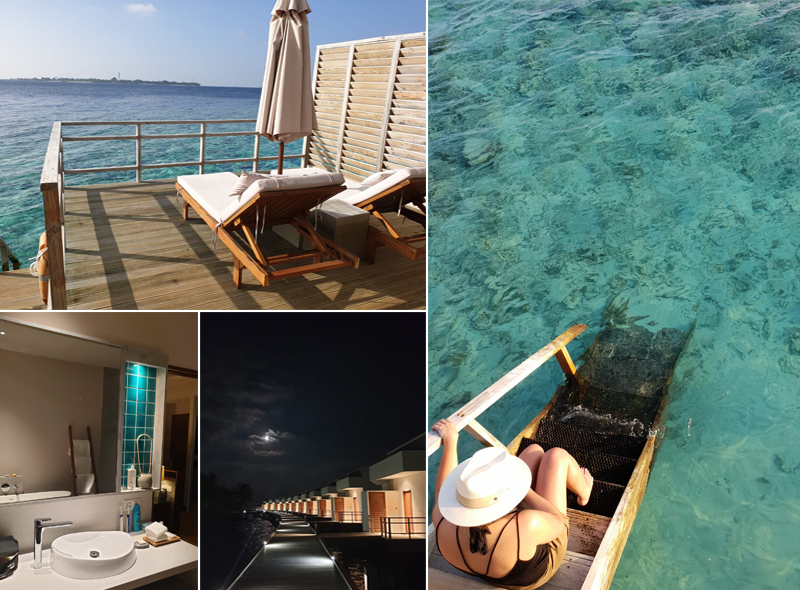 Dhigali Maldives was the perfect place to unwind and enjoy being together after an adventurous trip to Lion Sands. Overall, our Maldives and South Africa honeymoon was amazing. However, Lion Sands was our firm favourite, as everything was breathtaking. 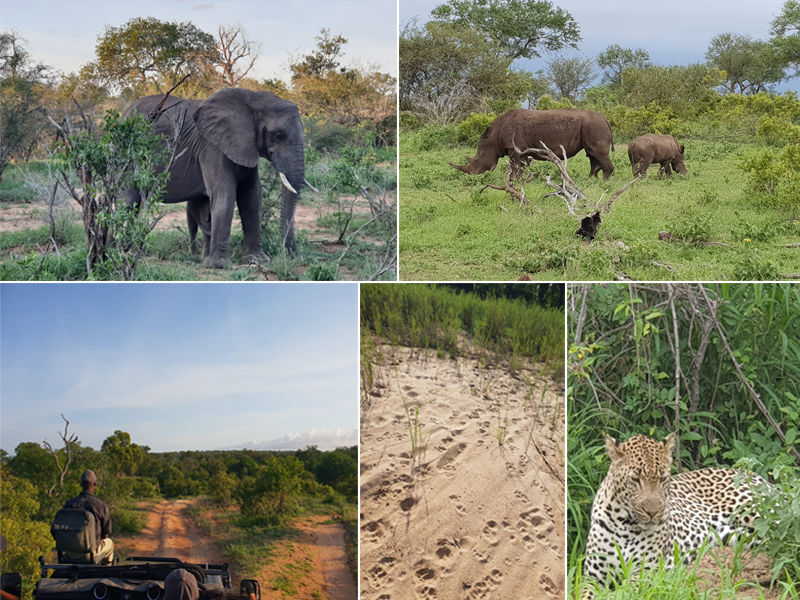 The service, food, hospitality, seeing the big five, the colourful birds, the experience of staying in the treehouse, our drivers and trackers persona and knowledge…just everything. We loved it so much and made such wonderful memories. We were also blown away by Dhigali with the beauty of the sea and pristine white sands. The main highlight of our trip was seeing the magnificent marine life including dolphins, sharks and the variety of different fish. The good thing was we didn’t have to go far to see fish, as we could sit on our decking in the water villa and observe them all. We would definitely recommend spending more than three days at Lion Sands as you won’t regret it. Not only that, we would also recommend spending the night in a treehouse if you’re brave enough. It will certainly be an amazing experience you won’t forget. 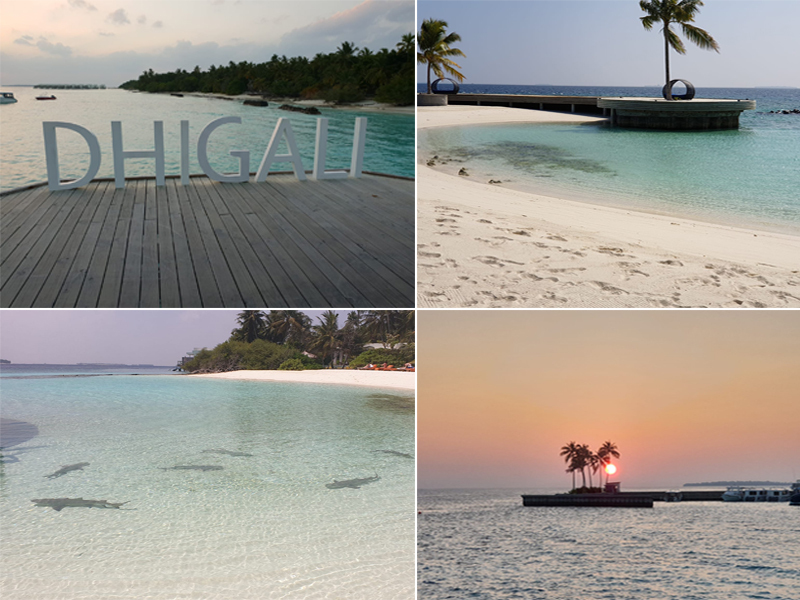 As for the Maldives, Dhigali was a stunning island, however, we would love to explore other resorts in the Maldives. 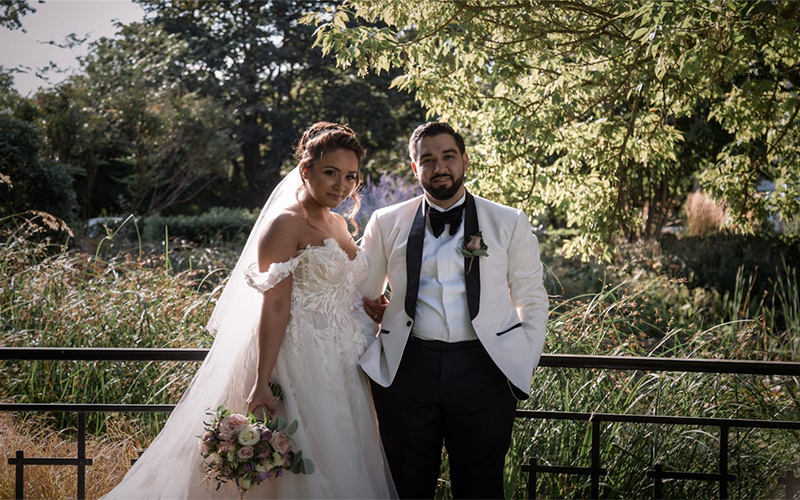 Leigh was professional and personable from beginning to end and worked his socks off to make our honeymoon memorable.